Courtesy of Lisa M Murphy, Keller Williams Real Estate-Blue Bell. Live beautifully in a stately single home in East Falls, just minutes from Center City. This is a one-of-a-kind distinguished residence in one of Philadelphia’s most beautiful, desirable and convenient neighborhoods. This elegant home is tailor-made for entertaining family and friends with great flow between the main living areas. The home features a two-story main entrance foyer with dramatic natural light from a custom two-story window. Off the main entrance, you~ll find a large living room complete with a working wood-burning fireplace and a bank of windows with great southern exposure that is perfect for indoor plants. The front of the home features a bright and airy family room with french doors leading to a lovely enclosed porch that houses a cozy home office. A spacious and well-lit dining room sits off the main entry and adjoins a charming updated kitchen with white cabinetry, black and white tile floor, stainless steel appliances, and a large pantry closet. The second floor features four bedrooms and three full bathrooms, including a very large master bedroom with a his and her closet and new spa-worthy en-suite bathroom. A separate area at the back of the home features a private bath and bedroom hideaway that is perfect for guests. The home is set-back from the road with established perennial beds and trees ready to bloom and provide fantastic curb appeal all spring and summer. The quiet backyard features a new brick patio, childrens~ play area, and fence. The original slate roof has years of useful life left and has been well maintained. The home is brimming with charm and has all the conveniences of a modern home: a completely renovated master bath; forced air heating and AC; gas stove; new AC unit and garage door/opener; refurbished original hardwood floors throughout; new windows in the majority of the home; new gutters; upgraded kitchen and electrical system. Storage abounds in large closets throughout the house and a partially finished basement (including a small cedar closet). Off-street parking is easy with a long driveway and two-car garage. 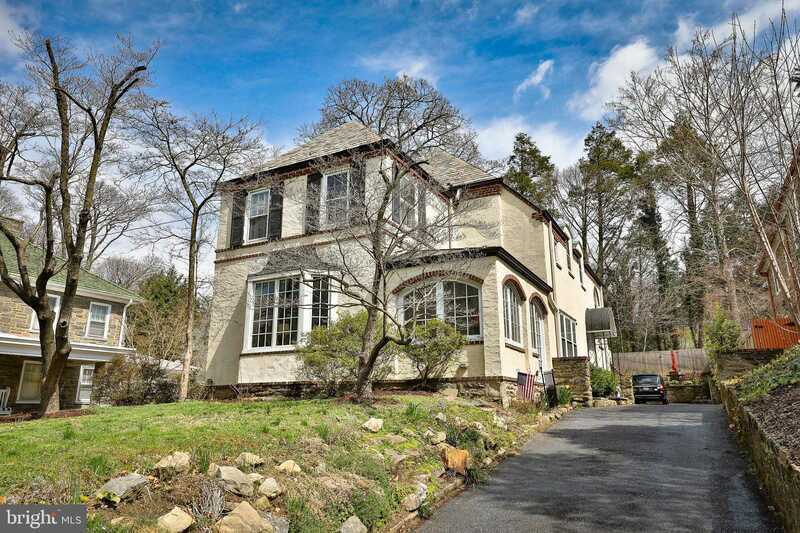 Get ready for summer entertaining in a not-to-be-missed East Falls beauty.